Two of the biggest reasons our users love JMP are its interactivity and its ability to dramatically reduce the time needed to perform routine yet critical analysis tasks. Indeed, the primary strengths of JMP lie in the ways in which it differs from conventional software, and we repeatedly hear from users who can’t imagine doing their jobs with any other tool. 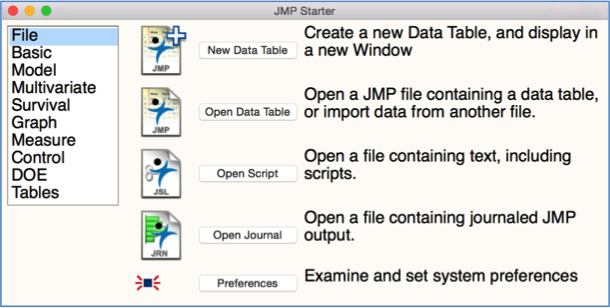 New users, however, may want a little assistance as they make the transition to JMP, and the JMP Starter (View > JMP Starter in Windows and Window > JMP Starter on Macs) is often where they begin. Options are categorized and described. And by clicking a button, the appropriate platform in JMP launches. Providing context-specific menus for a variety of job roles. Linking to documents, web pages and other resources. Including additional instructive or descriptive text. 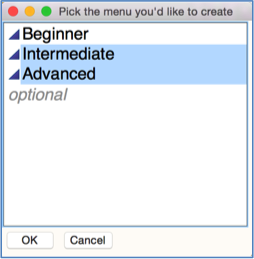 Now, you can quickly and easily create and manage customized menus like the ones in the JMP Starter, with a script, data table and example add-in that I’ve uploaded to the JMP User Community’s File Exchange (a free SAS.com Profile is required to access the files.) While the add-in is chiefly for illustrative purposes, it also installs with many icons that you may find useful as you create your custom menus -- see the download page for details. The next two images show a specifications table and the custom menu produced by it.